I anxiously await the arrival of my son (any day now) in the August heat of Abu Dhabi-- one of the hottest places on earth. 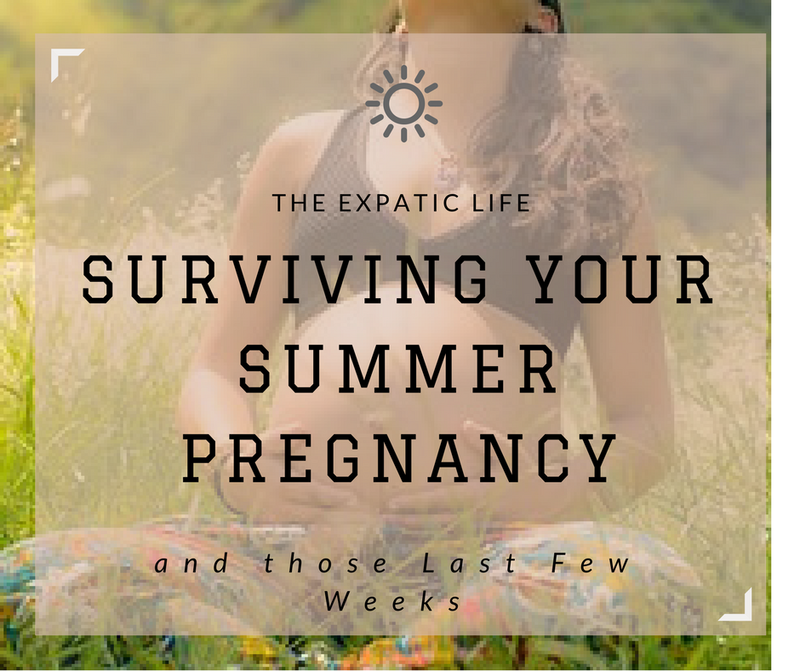 As I am finishing out my last few days of pregnancy, I share with you how I survived the summer and those uncomfortable last few weeks. One of the best pieces of pregnancy advice I received-- go enjoy the pool, it will take the weight off. For me, this proved to be true. Submerging myself in water was the only place I didn’t feel pregnant and the best part- our pool is chilled in the warmest months. I wasn’t fully in tune with how tough the extra weight and pressure was on my body until I had a method of taking it away. The 9th month is the most grueling and the pool never failed me. It’s a running joke between my husband and me-- I’ve pretty much lived my entire pregnancy in the pool. I’ve guilt him into going with me so many times, he’s complained (jokingly) about his well-established summer tan. Access to a pool isn’t an option for everyone and I am lucky enough for our apartment building to include one. If you have or can get access fairly easy, then my advice is give the pool a go. 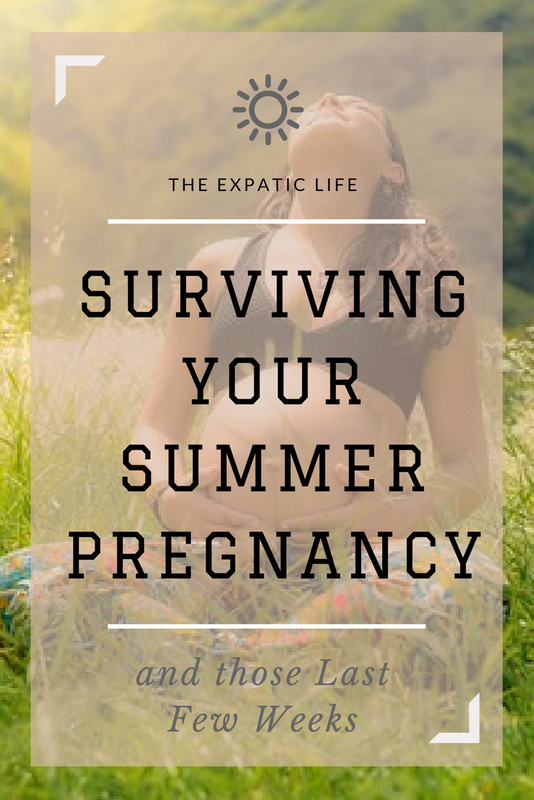 It’s a great option if you are feeling the pressure and weight of pregnancy or need to take a dip to cool off. As you can tell I coped with the aches and pains of pregnancy with water. Another example-- enjoying a relaxing warm bath (not hot as this can be dangerous during pregnancy). My baths became more frequent once the baby dropped in this difficult last month and I become even more uncomfortable with false labor symptoms (which are relieved by the warm water) Water was my best friend and my pregnancy problem solver. I would go to the pool and have a warm evening bath in the same day. I could not stand wearing anything remotely form fitting and once my looser clothing became tight-- I started stealing my husband’s. He didn’t mind and I teased "it was technically his fault for my need to wear them, so this was his sacrifice." I love his workout shorts and oversized t-shirts. The sweat wick material is handy in the summer heat. I also invested in a pair of maternity shorts I wore constantly on outings. Maxi skirts and dresses were always suggested to me, but both drove me nuts. Although the idea is they are light and breezy, I would sweat in this summer heat-- which was not comfortable if your thighs now rub together (thanks pregnancy). Have you heard the famous saying (or a version of)-- pregnant women run hot? Well it’s true. I couldn’t sleep or be comfortable if the thermostat was above 65 degrees Fahrenheit (18 degrees Celsius). Sitting in a warm room for very long made me feel overheated and nauseous on most days. Running the air conditioning in the heat of summer can tough on the wallet, but if you have the means to do so-- go ahead and keep it cold. Speaking of keeping it cold, carry an insulated water bottle-- everywhere. Having one was a life saver. No matter where I was or what I was doing, I could count on taking an ice cold sip to cool me down. If the bottle is insulated there’s no worrying about your water getting hot with the temperature outside and of course you will stay hydrated-- very important in pregnancy. The maternity hospital I go to offers free prenatal yoga to all its pregnant patients twice a week. I would go as often as I could. It did help stretch those achy parts and strengthen important muscles. Attending a class is not necessary to enjoy the benefits, there are plenty of free online videos if a class is not an option-- just check out YouTube. I will admit going for a walk once I was further along didn’t necessarily feel great, but I made sure to go on one most evenings. I noticed a walk allowed a better night's rest once my pregnancy became uncomfortable in the last few weeks and rest is an important key to surviving pregnancy. It helped in keeping up the physical activity you’re supposed to in pregnancy and a bonus-- my dog enjoyed it too. I went for regular pedicures (maybe once a month) during pregnancy for two reasons. The first-- I wear sandals often, because it’s hot and too difficult to put any other type of shoe on. If I wear open toed shoes then pretty nails are a must. The second and most important reason-- to enjoy a nice foot and calf massage. It felt amazing having my achy swollen feet rubbed and once I was noticeably pregnant they received a little extra love. Each pregnancy is unique and coping will differ from person to person. Some, all, or none of my methods will work for you, but it doesn’t hurt to give them a try. You will either find relief or continue your process of elimination. In any case I wish you the best. This post made me laugh because I currently live on a tropical island & previously lived in Saudi Arabia, so I totally understand the heat you are talking about. The pool was my absolute go to all as well, along with water because it is so so so easy to get dehydrated. I loved swimming during my pregnancy or even just bathing in the lake. Feels great! Thanks, I'll save this for when we start a family- really informative. I think I will not survive. I live in Netherlands where is constantly cold, windy and rainy. The few summer days we have here, we work from home, and the heat is unbearable. This is all great advice (I had mine in August so I get it!) I wish I had thought of the pool myself - it would have been a lifesaver. Good luck with your first! This is a great article. I wish it was around when I was pregnant with my son. Some of these seem like something you would just think to do, but when I was pregnant--I carried my son full term and some--and I was in pain, but I never thought to go get in the pool to take the weight off. That is a great idea. I would have lived in a pool too if I had thought of that option when I was pregnant. I remember my back and legs feeling like they were going to break at any moment. I enjoyed reading your article. Thank You so much for sharing! I live in Florida, and pregnancy is definitely miserable in the heat! The pool is a lifesaver, and there's nothing like feeling weightless in the last few months of pregnancy. I live in Florida and I can not imagine being pregnant in this heat. These will go tips.